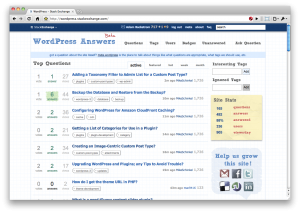 The WordPress Stack Exchange I blogged about last week has moved into its open beta phase. Over the next 81 days the community will attempt to build a following of committed users with the goal of becoming a full-fledged StackExchange site. I enjoy the Stack Exchange model very much. It's Q&A with a social twist, as your peers upvote your answers and increase your site reputation. I have been off-and-on active on Stack Overflow, the programmer-focused Q&A site, for two years now, dropping in occasionally to answer a few questions when I need to switch gears. Participating in WordPress Answers (as it's canonically known) has been a whole new experience, starting with the empty canvas of a website, participating in meta, being a more involved member of a community that is still in its infancy. 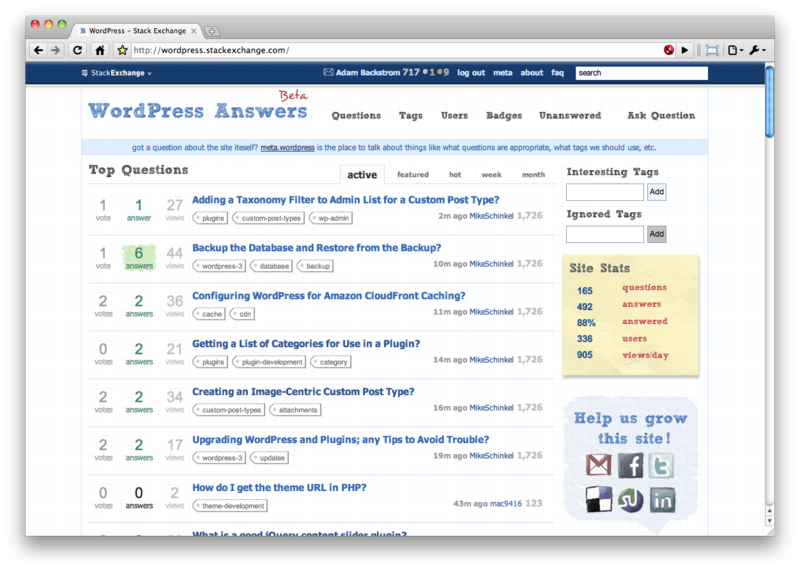 If WordPress is a part of your online life, I encourage you to help out by asking or answering questions. Do you have a problem with WordPress you just can't figure out on your own? Can you remember a question from your past that could benefit someone else if it were archived on the site? Do you want to challenge yourself and improve your skills by helping others with WordPress? Get in on the ground level.